Visit Academica and login using your access ID and password. Under "University Resources" choose "Access OneCard Account" from the list of links on the left. This will take you to our online account management site where you can add funds. Click on "Deposit to OneCard" and enter in your deposit amount (minimum online deposit is $15), credit card and billing information. Please note that the address you enter must match what the credit card company has on-file for you. Once you submit the information you'll receive an email confirmation to your WSU email account. In most instances, funds deposited online are available within 5-10 min. If you do not have the login information for your student's account you can still deposit money to their card; however, your student must give you this access. Students will need to log into Academica, go to "University Resources" and "Access OneCard Account". Once they are logged into their account they should choose "Guest Access" from the menu on the left. Students will need to enter the email address of anyone they wish to give guest access to and click "add". Once this is done an email will be sent to that account with instructions on how to login and add money. The minimum amount that can be deposited online is $15. In most instances, funds deposited online are available within 5-10 minutes. *Parents/Guardians please note that there must a FERPA release on file with WSU in order for us to share your student's OneCard account information with you. Checks and money orders are accepted at the OneCard/Parking Service Center in the Welcome Center, Suite 257. Funds deposited by check or money order are available the next day. (lobby near front desk, must have building access) 5110 Anthony Wayne Blvd. (lobby by elevator, must have building access) 5200 Anthony Wayne Blvd. (first floor in the vending area) 2771 Woodward Ave.
(first floor next to the reference desk) 320 E. Canfield St. The balance on a OneCard cannot exceed $500 per plan. Cardholders who want to review charges to their OneCard account may do so by logging into Academica and clicking on "Access OneCard Account" under "University Resources". After a new window opens, click on "View Account Activity" and choose the month you would like to review. Cardholders may view up to the last six months of charges on Academica. Any cardholder who would like to view activity earlier than six months prior to the current date should call the OneCard/Parking Service Center at 313-577-CARD or email onecard@wayne.edu to request the information. Please note that we will only email information to WSU secure email accounts. 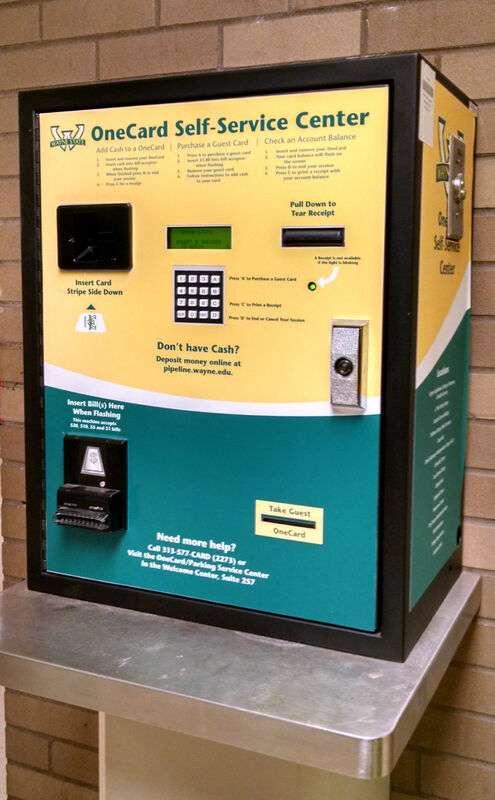 Cardholders who are disputing particular transactions or charges made to their account or who seek a refund for parking, washer/dryer usage, printing/copying, vending, food, or other purchases made with the OneCard should submit the Refund Request Form and any supporting documentation to the OneCard and Parking Service Center, 257 Welcome Center. Requests for refunds are not guaranteed and will be based upon the documentation submitted and an investigation by service center staff. An investigation may take up to three to five days depending on the time of year and the amount of requests. Full account refunds are only available should a cardholder leave, or no longer be affiliated with Wayne State University. Refunds can be issued to a cardholder whose account has a remaining balance of greater than $15 (there is a $15.00 administrative fee to close an account) at the time the request is submitted. To be reimbursed, complete the Account Cancellation Form and return it to the OneCard & Parking Service Center, 257 Welcome Center. The OneCard MUST be turned in to the OneCard and Parking Service Center in order for the form to be processed. Please note that it will take four to six weeks to process refunds. For the complete policy, please see the OneCard Terms and Conditions. The OneCard and Parking Service Center also oversees refunds for daily parking and the cancellation of parking assignments. The above Refund Request Form for daily parkers and Account Cancellation Form for parking assignments can also be used for these purposes. When canceling a parking assignment, forms must be dropped off in person or emailed from a WSU secure email account. No faxed forms will be accepted. For more information about refunds and cancellations of parking assignments, please visit parking.wayne.edu or call 313-577-CARD.